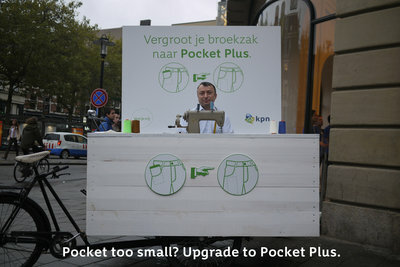 During the launch of the iPhone 6 in the Netherlands this morning, Dutch telecom provider KPN made sure future iPhone 6 Plus owners don't have to worry about bending their brand new iPhone 6 Plus. While waiting in line to get their new iPhone, a mobile tailor offered to supersize people’s pockets. Dutch telecom provider KPN launched a Christmas campaign this week starring a group of online gamers who’ve been friends for years but have never met each other in real life. The centerpiece of the campaign is a documentary that follows the seven online friends in their journey to an old pub in Kent where they celebrate Christmas together. The campaign revolves around the phenomenon of online friendships and urges everyone to celebrate their unique friendships this Christmas. Vlogger inspires two young boys to go on outdoor adventure in new spot for Dutch telecom provider KPN. If you think the internet makes kids hang around the house all day, take a look at this commercial. The spot is part of a larger brand campaign for the Dutch Railways, and is aimed to champion the freedom of public transport. Dutch top designers create Alzheimer SOCKS as part of the battle against Alzheimer's disease.